Lists of Note curates 125 unputdownable entries from a list of names that are as eclectic and intriguing as its contents, which include myriad reasons given by ancient Egyptians for missing work, Albert Einstein's demands of his estranged wife, F. Scott Fitzgerald's extensive conjugation of "to cocktail," and many more. Rarely intended for the public eye, these lists reveal hopes, priorities, and musings in a most engaging and entertaining way. Each transcript is accompanied by an artwork, most a captivating facsimile of the list itself. 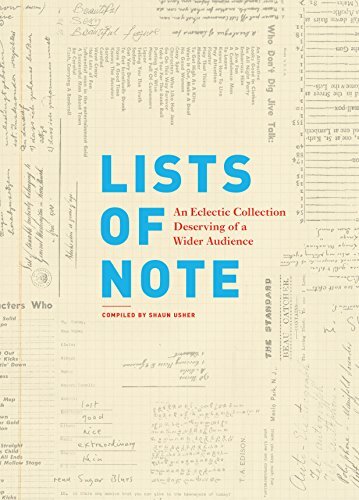 Richly visual and irresistibly readable, Lists of Note is a testament to the human urge to bring order to, poke fun at, and find meaning in the world around us—and is a gift of endless enjoyment and lasting value.